In key contests across the South, Democrats are increasingly resorting to harsh, race-based tactics in an effort to scare black voters to get to the polls on Election Day. Democrat machines in Louisiana, Florida, Georgia, and North Carolina are worried that their African American base might not turn out for them this year and are taking steps–some of them controversial–to ensure that blacks go to the polls. The most recent census records show only four in ten black Americans vote in midterm elections. As Election Day nears with important races showing polls at near even splits, the White House and the Democrat Party have found it necessary to put money into pushing minorities to vote, at a time when they may have thought they could focus on specific candidates instead. One race in particular is sending shivers down Democrats’ spines. With a race trending to her Republican challenger, incumbent Democrat Senator Mary Landrieu is desperate to turn out her African American base, but signs are that she may be failing to excite them to go to the polls. To win outright, Landrieu would need over 50 percent of the vote in Louisiana, but that seems more remote with each passing day. Worse, if a runoff is in the offing, she loses by four points in a head-to-head with GOP candidate Bill Cassidy. While Democrats in the other three southern states do not have to worry about runoff elections, those in uncomfortably close races, party bosses, and advocates are increasingly turning toward scare tactics to win. Democrats in Georgia, Florida, and North Carolina are telling voters with a straight face that Republicans will “impeach Obama,” that voter ID laws are little different than Jim Crow revisited, and they are invoking scenes of lynchings and civil rights violations if Republicans win. 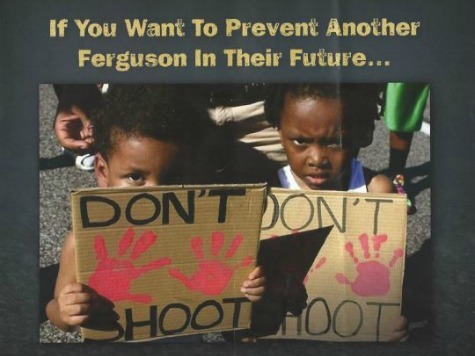 Another tactic Democrats are employing is linking the August shooting of black Missouri teenager Michael Brown to the elections in an effort to make black voters think that a resurgent Republican Party will mean increased killings of blacks. Mailings in Louisiana, Georgia, and North Carolina have featured images of young black men with their hands in the air, along with rhetoric warning blacks that unless they vote, they will be mowed down in the streets by white policemen.